Making picture-taking and sharing easier and more fun. Built to resist shock when dropped from heights of up to 80 cm, to resist water up to depths of 3m, and resist dirt, the COOLPIX S30 welcomes hands of all sizes to shoot with it in carefree fashion. It's also safe to use it at the pool and around water. 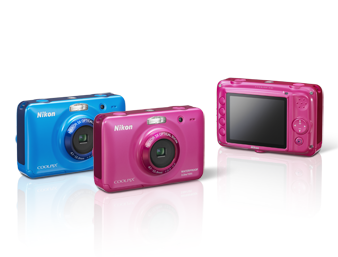 The COOLPIX S30 features a unique symmetrical design with buttons placed and sized for maximum ease of use. The large LCD monitor offers a clear view of the interface, which is designed to be easy to understand. And the camera goes from power-up to either still image or movie shooting mode with one press of dedicated buttons. Create original slide shows with animated effects and music to enjoy with friends or family. The built-in album-making feature lets you create scrapbooks for quick access to favorite pictures and for later enjoyment at any time. Two voice messages can be recorded for each picture, which creates opportunities to share related thoughts or comments with a friend or loved one.